Guitar Center’s new retail location in Louisville, Kentucky. The staff at Guitar Center’s new retail location in Louisville, Kentucky. Attendees of the Grand Opening event for Guitar Center’s new retail location in Louisville, Kentucky. The Guitar Center Studios facility at Guitar Center’s new retail location in Louisville, Kentucky. WESTLAKE VILLAGE, CA, February 7, 2011 — At 7:00 p.m. on January 27, 2011, Guitar Center launched a new retail location at 4600 Shelbyville Road in Louisville, Kentucky, kicking off a weekend-long grand opening celebration. The 17,500-square-foot superstore’s opening has brought unprecedented product selection and opportunities to artists in the area, along with the unparalleled knowledge and experience of the store’s dedicated staff. 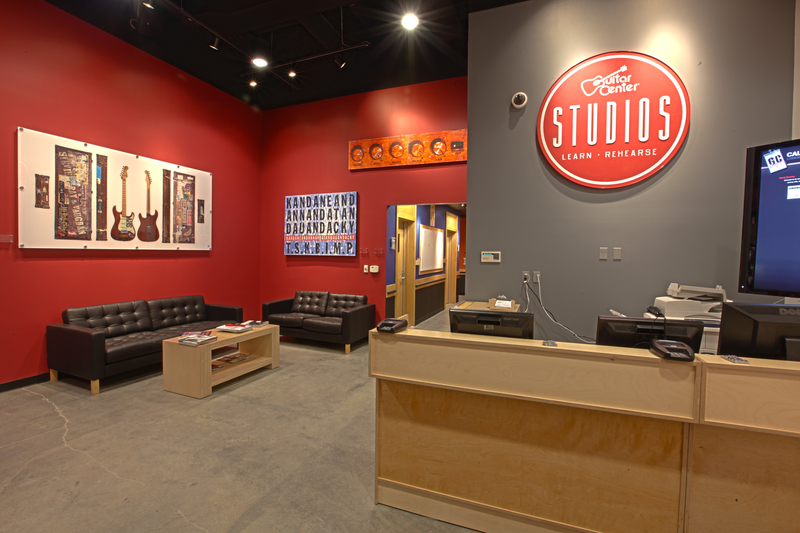 Guitar Center Louisville also features GC Studios, the retailer’s first embedded lesson and rehearsal facility. To celebrate the opening, the Grand Opening Weekend featured exclusive savings, including guitar and drum essentials at up to 89% off list price, gear giveaways and free events tailored to local musicians. Guitar Center’s plans for the Louisville location go well beyond offering the biggest selection at the best prices. For the first time in Guitar Center history, the Louisville location features an in-house, state-of-the-art lesson and rehearsal facility called Guitar Center Studios, which will create unrivaled opportunities for Louisville musicians of all ages and skill levels. Guitar Center Studios will provide music lessons for all skill levels, from beginner to advanced, featuring certified instructors providing a world-class curriculum, as well as one-on-one Pro Tools, Logic Pro and GarageBand courses. Rehearsal spaces will be fully equipped with the latest backline gear, and musicians will have access to a digital recording of their rehearsal sessions. Guitar Center Studios will serve the Louisville area as the most modern and affordable lessons and rehearsals facility in the city. The store also features GC Garage, offering on-site guitar repair services. Building on Guitar Center’s ongoing initiatives designed to educate and inspire artists nationwide, the Guitar Center in Louisville will offer unique opportunities for musicians to craft their skills, maintain their instruments and experience first hand many aspects of the music industry. Guitar Center Sessions, for example, is an ongoing music education-based initiative that provides musicians with the chance to network and gain insight and knowledge from their musical influences in a comfortable and intimate setting. As a part of its Grand Opening Weekend, Guitar Center produced a series of Guitar Center Sessions in Louisville: Dave Elitch, drummer for The Mars Volta, on Friday, January 28; Avid, makers of Pro Tools, presenting “Music Production 101” on Saturday, January 29; and Johnny Hiland, acclaimed Nashville session guitarist and solo artist, on Sunday, January 30. Guitar Center Sessions aim to help musicians further their aspirations and provide tools for career growth by producing an evening of dialogue and music from some of their favorite artists. Past artists to participate in Guitar Center Sessions include Slash, Peter Gabriel, Jane’s Addiction, Joe Satriani, Peter Frampton, Pete Rock, Dave Mustaine and RZA. In addition, each year, Guitar Center offers nationwide programs designed to spearhead creativity and highlight the nation’s most promising undiscovered talent. Louisville residents will now be able to participate in these ongoing national events from their hometown: “Your Next Record” gives artists a chance to record with some of the top recording artists in the country, from legendary guitarist Slash to country superstar Keith Urban; “Guitar Center On-Stage” gives undiscovered bands the opportunity to compete against their peers for a chance to share a stage with their idols; and Guitar Center’s “Drum-Off” and “King of the Blues” are national competitions that highlight local talent from across the country, giving them widespread exposure and the chance to win incredible prize packages. Located at 4600 Shelbyville Road, the 17,500-square-foot space features extensive showrooms with the latest products for the musician, from guitars, amplifiers, percussion instruments and keyboards to pro-audio and recording equipment. In addition to special Grand Opening Weekend programming, early shoppers also enjoyed exclusive savings throughout opening weekend. 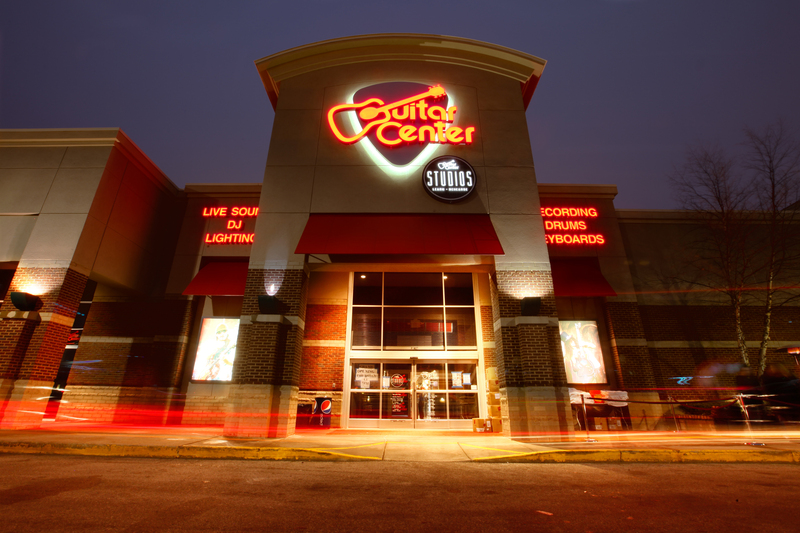 Guitar Center Louisville is open seven days a week. Store hours are 11:00 a.m. to 8:00 p.m. Monday through Thursday, 10:00 a.m. to 8:00 p.m. Friday, 10:00 a.m. to 7:00 p.m. Saturday, and 12:00 noon to 6:00 p.m. Sunday. Guitar Center Studios hours are 11:00 a.m. to 12:00 a.m. Monday through Thursday, 10:00 a.m. to 12:00 a.m. Friday, 10:00 a.m. to 12:00 a.m. Saturday, and 12:00 noon to 10:00 p.m. Sunday. Photo Caption 1: Guitar Center’s new retail location in Louisville, Kentucky. Photo Caption 2: The staff at Guitar Center’s new retail location in Louisville, Kentucky. Photo Caption 3: Attendees of the Grand Opening event for Guitar Center’s new retail location in Louisville, Kentucky. Photo Caption 4: The Guitar Center Studios facility at Guitar Center’s new retail location in Louisville, Kentucky. Guitar Center is the world’s largest retailer of guitars, amplifiers, drums, keyboards, recording, live sound, DJ and lighting equipment. Our retail store subsidiary presently operates 215 Guitar Center stores across the U.S. We are also the largest direct response retailer of musical instruments in the United States through our wholly owned subsidiary, Musician's Friend, Inc., and its catalog and Web site, www.musiciansfriend.com. In addition, our Music & Arts division operates more than 100 stores specializing in band instruments for sale and rental, serving teachers, band directors, college professors and students. More information on Guitar Center can be found by visiting the company's Website at www.guitarcenter.com.